Onto our penultimate round! There looks to be some pretty important and close games this week as the finals race is still wide open. Also, for those following along - I finally got my neck brace off today after 7 weeks! There is still a fair bit of rehab to to go but looks like I’m in the clear regarding long term issues. Thanks for all the messages of support I’ve received. 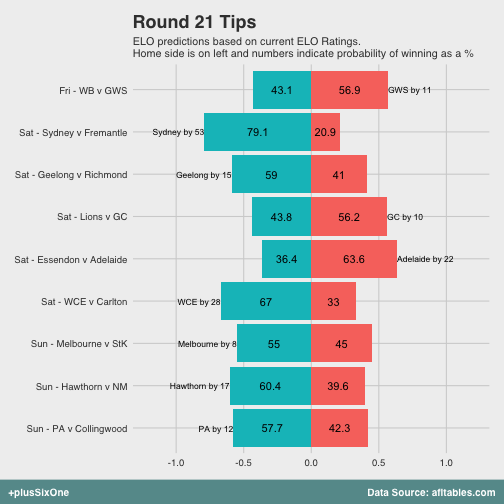 Anyway, onto this weeks matchups - read on to see who we are tipping! We brought back match importance last week so I’ll keep putting that in over this and next week. It is becoming pretty apparent which games are important but nonetheless, it is good to quantify! The biggest game this week looks to the Bulldogs v Port game. It has pretty big implications for Port’s top 4 chances but also for the Bulldogs top 8 chances. About a 50% swing for both! Most of the remaining games all see around 45% to 60% swings for one team chances of either the top 8 or top 4. This week will start to cement some of those positions down so it will be interesting to follow along. The only games with little interest are NM v St Kilda and Hawthorn v Carlton. 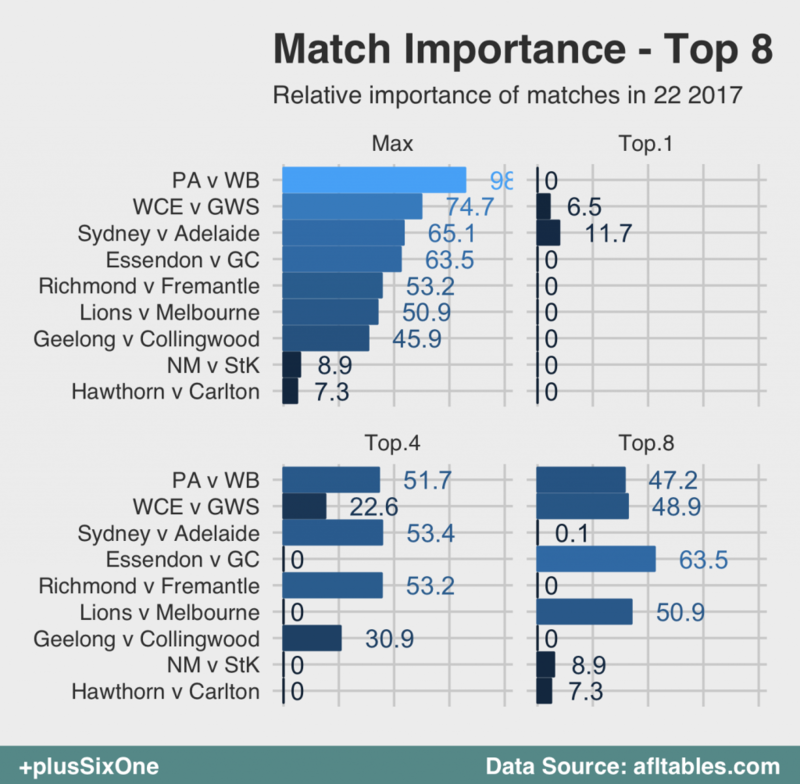 While technically the Hawks and Saints can each make the top 8, their chances are still small and a win only slightly bumps that up. Nonetheless, they are still alive! I like to always consult The Squiggle each week to see where other models place each team. It is generally a pretty good proxy for a close matchup when there is disagreement amongst the computer models. Over there this week, the two matches with at least one disagreement are also the two closest matches for my model! In both cases, one or two models have gone against the grain. Unfortunately (or fortunately if it comes through), mine is one in the Port Game. Most models are tipping the Dogs but our model and FMI are giving it to Port. We talked above how important this game is for both teams so it will be an exciting one for sure! 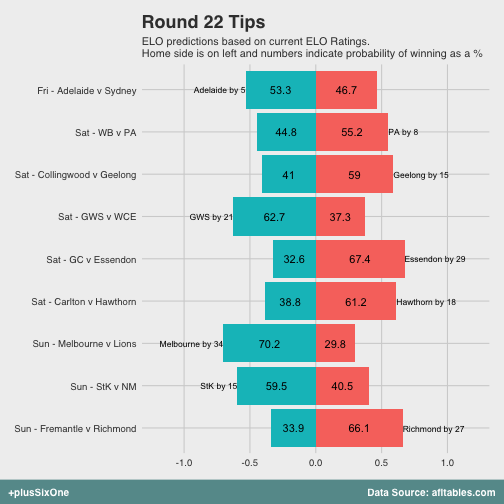 In the other match, The Squiggle interesting gives it to Collingwood by 1 point. Happy tipping in what should be a pretty tense round for lots of supporters!